For many, Independence Day is nothing more than a paid day off of work where people attend grilling festivities, parades and fireworks. As farmers, we work on holidays and this year is no exception. Animals need care every day and that’s exactly how our day will start. This is the reality of farming. Granted some people will reflect and ponder what the 4th of July really means to them. As I reflect, I am filled with gratefulness that we live in a country where we do have freedoms. We were able to choose to farm, even with no holidays off. It is a difficult life, but when you are married to a man who was “born to farm, ” I truly appreciate that we have been blessed and given this choice. Not everyone is that fortunate. Not only do we have the choice to farm, we also have the choice to raise livestock and the types of crops we plant. Many think “big ag” companies tell us what we can and cannot plant and that is simply not true. If we wanted to plant 1000 acres of banana trees, we could. They wouldn’t grow, but we could still plant them. On our farm, we choose to plant corn and soybeans because of our growing season, our soils, and our markets. Those conditions make these types of crops a good choice for us. We can also grow whichever type of corn we feel makes best sense for us. Monsanto (or any other biotech company) does not have a hold over us on what we can and cannot grow–again another myth. In fact, many of us welcome the new seed technologies Monsanto and other companies have developed. Our crops look better, we have fewer weeds, we can withstand more extreme weather conditions and we use less pesticides. 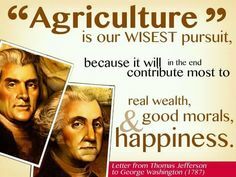 And as independent as we try to be, our government does like to put a strangle hold on farmers. Regulations and more regulations are one of the most frustrating aspects about farming. We, as farmers, understand the need for regulations but at times, the government likes to “overreach” it’s authority. And while I try not to be too political, I can’t help but talk a little about our government overreach on a day like today. While in college, I took a class on Early Political Thought. Let me just say, our forefathers would turn over in their grave if they saw what is happening to our country. We need to maintain our individual independence and be more self reliant. We don’t need more government, in fact, we need a lot less–the pendulum has swung too far. It’s all about balance. And the challenge is keeping the pendulum closer to the middle. Please enjoy your 4th of July holiday. And take some time and remember all of our servicemen who gave the ultimate sacrifice for the freedom we all enjoy today. I love your stories! I too married a man who was born to farm. We live in Oklahoma and our operation is different from most everyone here. We raise 60 acres of vegetables (our main income), as well as soybeans, alfalfa hay, and cattle. Hope your crops are bountiful, and prices are great. Thank you! What kind of vegetables do you grow? Do you grow for canning company or local markets? Have a great 4th! Thankful for folks like you to work the land and grow for us to have food on our table. God bless you and family. July 4th the reason we have choices.